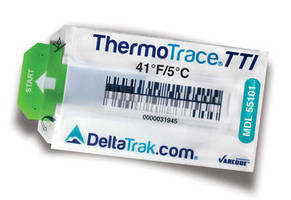 Pleasanton, California, – DeltaTrak® Inc., a leading innovator of cold chain, food safety and environmental monitoring solutions, is honored to announce that its ThermoTrace TTI Time-Temperature Indicator Label has been selected as a finalist for the 2015 RD 100 Awards in the Process/Prototyping category for supply chain management and operations. A panel of independent judges and editors from RD Magazine annually recognizes the top 100 most technologically significant products. The award acknowledges companies for design, development, testing, and production of exceptional products and the positive effects they have for end users in the field. Winners will be announced at the annual RD technology conference on Friday, November 13th in Las Vegas, Nevada. ThermoTrace TTI indicator labels are a low-cost solution for auditing the supply chain, using a patented barcode system for documenting temperature abuse and tracking where and when it happened. The labels monitor accumulated temperature abuse which directly correlates to temperatures recorded with electronic data loggers when evaluating time exposed above threshold. A recent study by University of South Florida compares the ThermoTrace TTI to data loggers, showing they have a 96.6% correlation using Degree Minutes and a 93% accuracy using Mean Kinetic Temperature (MKT) calculations. These labels create an audit trail to verify and document perishable commodities have been kept under correct temperature conditions. Scanning is done with a smart phone or standard barcode reader. A cloud-based application captures and stores information, including the label serial number a quality code, date, time, reader identification and location at the time of the scan. ThermoTrace TTI is a unique traceability solution for HACCP, FSMA (Food Safety and Modernization Act), PTI (Produce Traceability Initiative), and other regulatory compliance. Users at every check point along the supply chain are able to scan the label then type in delivery notes, take photos (e.g. shipping documents, or proof of damaged products), and scan a secondary barcode (e.g. lot code, product code, or customer order number). All this information is linked to the label serial number and captured by the cloud-based application. Reports are generated for analysis and evaluation of cold chain logistics management practices. Immediately after scanning a label, the cloud-based service can be set up to send email and text message alerts to selected personnel who can take immediate corrective action when temperature abuse occurs. Messages can be customized, color-coded, and delivereded in multiple languages. ThermoTrace labels monitor transport and handling of food products, fresh seafood, and are ideal for last mile deliveries so consumers can verify products arrive in good condition. Future models will be available to track vaccines and other pharmaceuticals. ThermoTrace TTI are a cost effective tool for producers and receivers to better understand the effectiveness of their supply chains and protect consumers by delivering high quality, safe products. Contact DeltaTrak® by phone at (800) 962-6776, or by email: marketing@deltatrak.com. Additional information can be found at: www.deltatrak.com.